Blackhawks and Apaches may be the poster-choppers of America's Special Forces but much of the heavy lifting that makes those missions possible is handled by the venerable CH-47G Chinook. And with the most recent round of modernizations, this Vietnam-era workhorse is ready for the 21st century. Chinooks first entered service in 1962 as troop transports and heavy-lift cargo carriers, immediately proving their worth and quickly becoming a logistical backbone of the US military (not to mention the 19 countries where Boeing exports the platform and a variety of commercial users). These 98-foot long, double-prop helicopters are powered by a pair of 4,733 hp Lycoming turboshafts which allows them to hoist either 55 fully outfitted troops or 24 evacuation litters and their requisite attendants—28,000 pounds of cargo in all—at speeds up to 196 mph and as far as 450 miles. They aren't heavily armed, usually only carrying a couple 7.62 mm machine guns, though the dedicated special ops variant—the MH-47G—does have a few tricks to help its crew mitigate the dangers of incoming fire. Not only is the 47G outfitted with the digital Common Avionics Architecture System (CAAS), a fully integrated comm system with global reach widely considered to be the most advanced piece of helicopter avionics in the world today, it also packs terrain-following radar for nap-of-the-earth and low-level flight operations even in whiteout conditions, integrated FLIR capabilities, a monolithic framed fuselage structure, and double-capacity fuel tanks for extended range and loiter times. 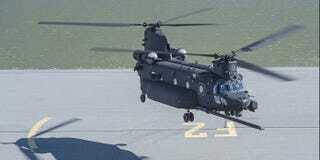 In short, the MH-47G constitutes the state of the art in stealthy transport chopper technology. The variant was first introduced in 2004 when the SOC ordered upgrades on 36 MH-47D/E's. The military subsequently announced that it had tapped the aerospace manufacturer to produce an additional 8 newly-built choppers to round out the program by 2015 at a cost of $300 million. On Monday, Boeing made good on the agreement, delivering the first newly-built (as opposed to modernized or upgraded) CH-47G Chinook of the batch to U.S. Army Special Operations Aviation Command.